This post is an entry for the #MeatMatters Challenge, sponsored by Simply Beef and Lamb. Learn more about the benefits of cooking and eating beef and lamb along with recipe ideas and inspiration here: https://www.simplybeefandlamb.co.uk. I haven’t been paid for this post; however I was provided with a £10 Tesco voucher in order to buy the necessary ingredients for this recipe. The above challenge was actually to create a 30 minute meal using either beef or lamb. 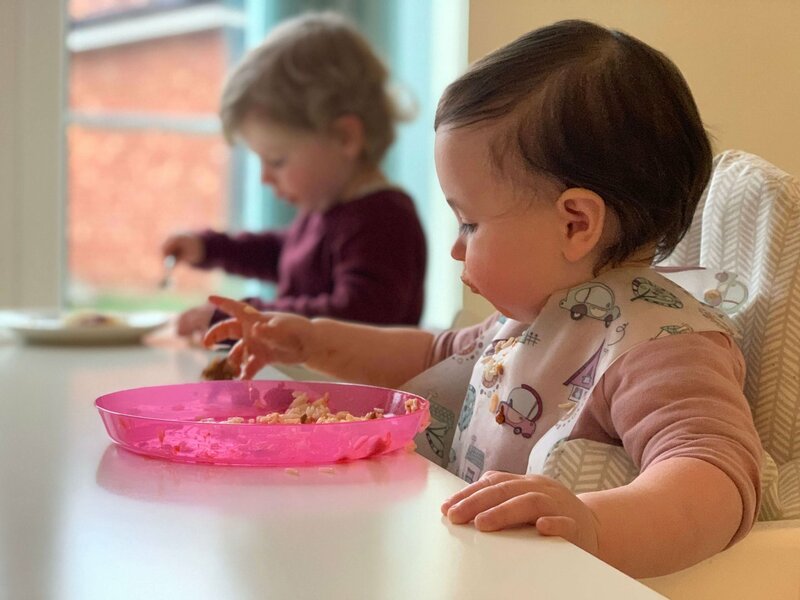 As a mum of a one year old and a two year old, though, it’s virtually impossible for me to spend thirty minutes standing at a cooker, creating a delicious, nutritious meal, just as the toddler witching hour strikes! 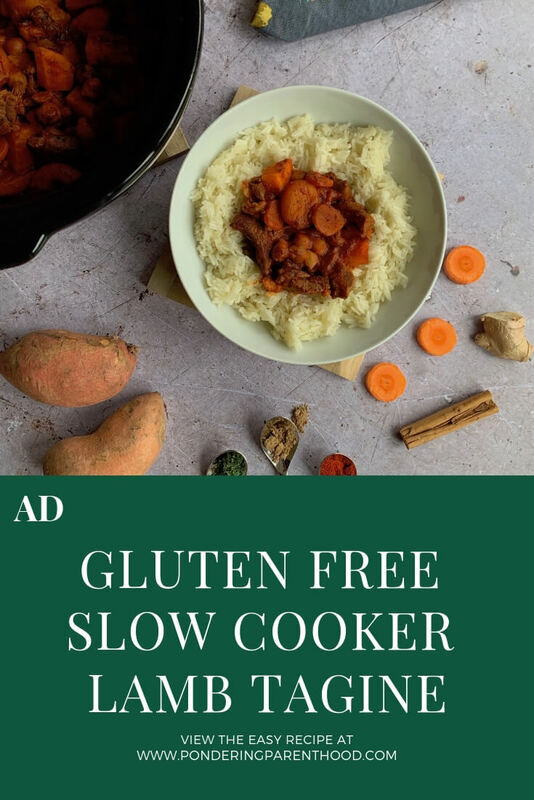 For this reason, I’ve decided to share one of my favourite slow cooker meals, a gluten free moroccan lamb tagine. 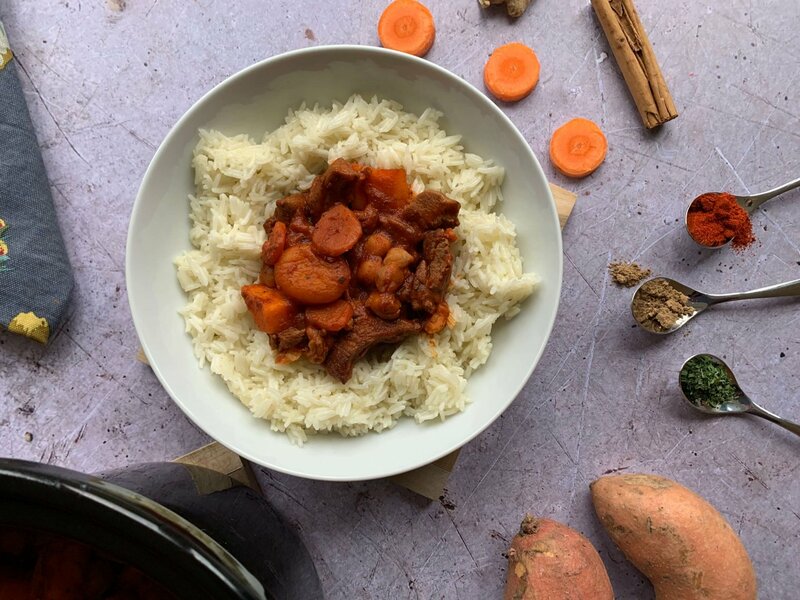 It takes much less than thirty minutes to prepare and pop in the slow cooker, and just requires some rice to be served alongside at dishing up time. If you’d prefer, though, you can just cook this on the hob and boil the sweet potatoes in a separate pan, stirring them through at the end. So if you don’t have a slow cooker, all is not lost! One of my goals for 2019 was to use my slow cooker at least once per week. I’m proud to say that I’ve managed it so far – in fact, I’m a complete slow cooker convert and some weeks I use it two or three times. We love this particular meal so much that we usually have it around once a fortnight. It’s definitely a family favourite! I love the almost complete lack of effort. Obviously I need to prepare it and get it into the slow cooker, but I can do this in the morning just after breakfast, when the girls are fresh and content, with full bellies! 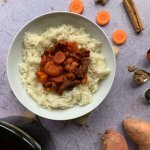 I’ve found that some slow cooker meals are somewhat unbalanced when it comes to the ingredients, often severely lacking in the vegetable department! 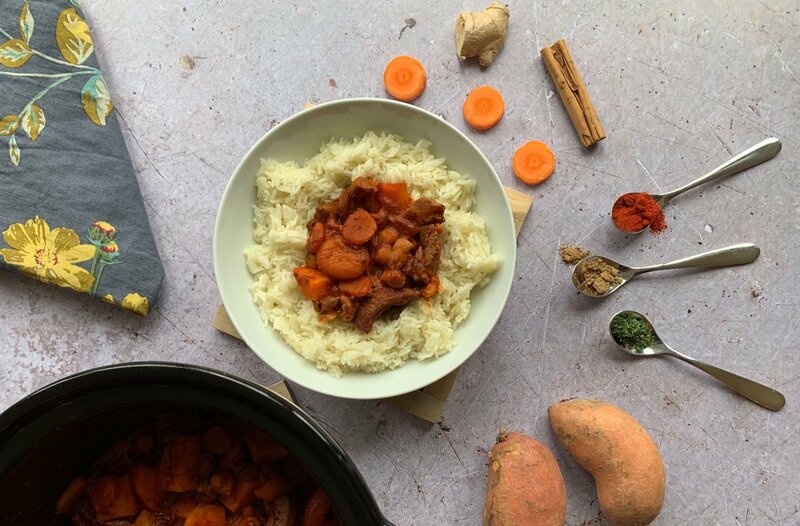 This dish contains tomato passata, carrot, chickpeas, apricots and sweet potato, as well as lamb, which is naturally rich in protein and provides seven vitamins and minerals that support good health and well-being*. So I feel confident that I’m providing us all with a healthy and nutritious meal. 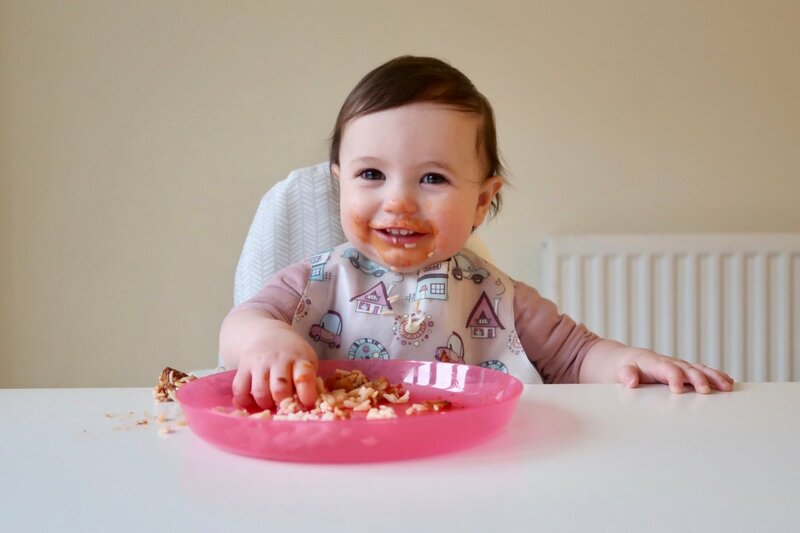 We did baby-led weaning with B, and she’s eaten the same meals as us almost since she started eating solid foods at six months. This dish ticks that box too, as it’s flavourful, with a fragrant mix of herbs and spices, but doesn’t contain any salty stocks. In fact, I don’t season it at all, as it simply doesn’t need it. As you can see, the girls both love this gluten free lamb tagine, and Matthew and I like being able to enjoy a proper ‘grown up’ meal that’s good for the children, too. I’m definitely not one for making different meals for each member of the family! Instead, I prefer to make something that we all enjoy. Again, this recipe ticks that box. M even asked for seconds, so if you’re looking to try a new lamb recipe, then she’d heartily recommend this one! Heat the oil in a large pan. Brown the lamb until sealed, then transfer to a bowl. Add the ginger and carrots to the juices in the pan. Cook until slightly browned. Then tip the browned lamb back in. Add the tomato passata, chickpeas, apricots, herbs and spices. Stir well, then leave to simmer for 5 to 10 minutes before transferring the whole lot to the slow cooker. Cook on low for 6-8 hours. Around one and a half to two hours before you want to eat, add the chopped sweet potato to the slow cooker. If you forget or are out for the day, you can boil them just before you are ready to eat, and stir them in at the last moment. Serve with fluffy rice and enjoy! *Lamb contains niacin, vitamin B6, vitamin B12 and zinc, and is a source of potassium, phosphorus and pantothenic acid. I do love my slow cooker (currently has BBQ pulled pork simmering away). I must confess we don’t have much lamb, only because I never know what to make other than a roast dinner. I’ll have to try this out ! We buy lamb especially to make this dish. It’s a firm favourite and tastes great every time. Simply delicious and so easy to prepare. It is so flavourful, for very little effort, which is always a win!